Yesterday was filled with great news and so I have to start today’s post by sharing it. Yesterday, I was offered a position with the Department of Human Nutrition to be the Program Administrator for a nutrition study. I’ve loved working at the Center on Disability Studies for the last two years, but getting the chance to work on a project related to food is just such a wonderful opportunity to work on something I truly have a passion for. 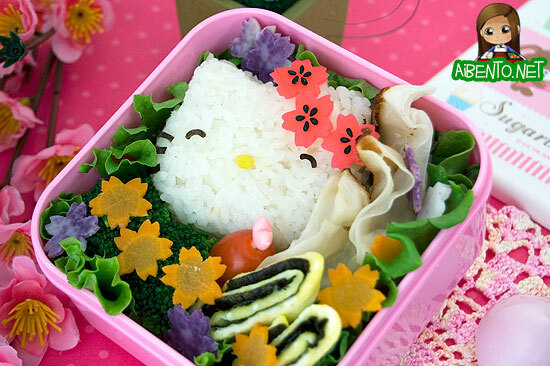 The other news is related to Yum-Yum Bento Box . Yesterday, my editor informed me that City Editions will be translating and distributing a French language version of the book!! French bento fans will no doubt be very happy to hear this and I’m very excited that our cookbook will now be accessible to another country in their home language! 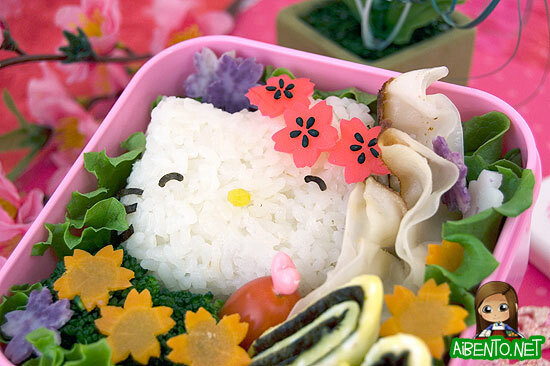 The girl theme continues and to me, nothing says girl more than the world’s favorite kitty cat, Hello Kitty! I might have gone a little overboard with the sakura flowers, but it was kind of the point anyway. 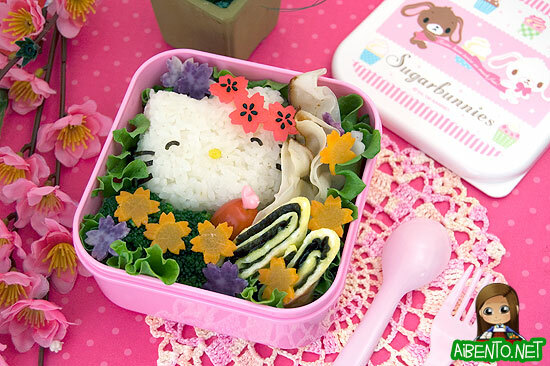 One of the things I love most about Hello Kitty is how they adapt her. Among my favorites is the Hawaii themed designs of her such as surfer Hello Kitty and hula Hello Kitty. Baby Girl even has a UH cheerleader Hello Kitty shirt! To make the onigiri, I used a Hello Kitty ice cream mold, which I have never in the last two or so years since I bought the things, ever made ice cream with. How funny is that? I actually don’t even know how to do it, but I guess now that I have an ice cream machine, I can just pour some in when it’s fresh and then freeze it. Maybe I’ll do that for my niece’s birthday this month. I’m sure she’d flip out over that. I couldn’t decide on which angle I liked the best, so here’s another one from the side. To cut the flowers, I sliced raw carrots and a raw Okinawan sweet potato with my mandoline, then boiled the slices for a couple of minutes. I used a sakura cutter from this set that can be bought on From Japan with Love. I used a nori punch for the eyes and a squeezed straw to cut out her nose from a piece of takuan. For her flowers I cut the top off of some kamaboko and gave the scraps to my resident “kamaboko machine”, Buddy. I opened the container that had half the block sliced up for him to eat and said he could have some. Later on when I was getting ready I saw him walking around eating the half block…… I really need to learn to be more specific with him. I placed five roasted sesame seeds into the middle to give the flowers more detail. Usually I’d use a tweezers for this, but I’ve gotten all my tweezers mixed up and so now I can’t use them for food because I can’t remember if I’ve used them for tweezing eyebrows or trimming toenails and I just don’t want to take the chance already. Next pair I buy, I’m definitely labeling! I used a toothpick by dabbing the tip onto a piece of kamaboko to make it sticky. On the side of her are three pork gyoza. The other day Maki sent me the link to an Ajinomoto commercial one of her bentos is in and I went to the wrong video and it was a commercial for their gyoza where the guys are eating gyoza and it’s making this loud *crunch* noise. I was so freaking dying for gyoza after that, thankfully I had a package at home. I ate like seven for breakfast and put three in this bento. On the side are two pieces of nori tamagoyaki, broccoli, and a cherry tomato. I keep forgetting to get back on track with my Docubentory. Hopefully more tomorrow!